Available In Several Finishes Including Flat Black (shown), Iron Red, Rust and Dark Green. 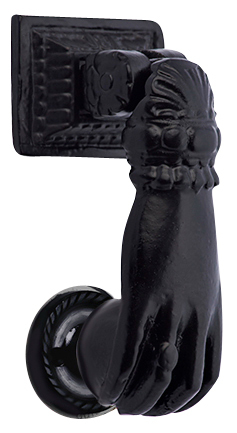 Solid Iron Ball-in-Hand Door Knocker (Matte Black Finish) - Constructed from solid iron and hand finished, each knocked measures 4 1/2 inch tall by 1 1/2 inch wide. The approximate projection is 2 inch. The rest measures 2 1/4 inch tall by 1 7/8 inch wide. This comes with a circular strike. The bolt on the back is made to accept a variety of mounting methods - including a steel or brass coupling, internally threaded reverse-mount bolt (on the rear of the door). These couplings are not included.